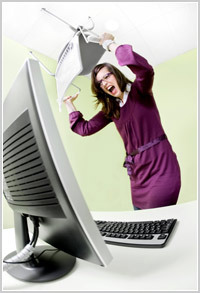 The highest frustration levels are understandably brought on by computer crashes, which cause frustration in 77% of the men and 85% of the women. This is followed by slow load times for web pages, which frustrate 56% of the men and 66% of the women, and Internet advertising, which frustrates 47% of the men and 52% of the women. We found this highly interesting. What accounts for the difference between men and women here? It seems too large to simply be explained away by a statistical anomaly since the sample base was almost 4,000 people. The survey got 3,812 responses. 717 from women, 3,060 from men, and 35 who did not to divulge their gender. You can read the resulting article (in Swedish) on the IDG.se website. It should be noted that most PC för Alla readers are probably close to what can be considered “the average Swedish Web user”. It’s not a magazine directed at advanced users or experts. The highest marginal differences between men and women in this survey are directly related to timing issues (slow time of web pages – 17%; frustration re broadband speed 16%). Could it be that woman have more to do and thus less time to waste?